Foto Sketcher provides access to some interesting picture filtering techniques that professionals who use Adobe Photoshop on a daily basis will (probably) laugh about. Untalented folks like me one the other hand like the effects that can be produced in no time with little effort. It's all about a few sliders actually. Foto Sketcher provides access to those filters in real time. 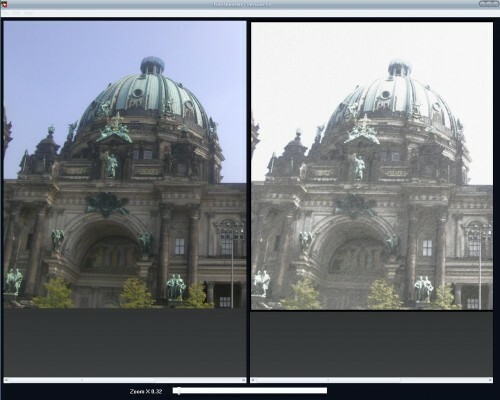 The user loads a picture from his computer and the software will display the original image on the left and a preview of the resulting image on the right. Effects range from Pencil Sketch that you see in the picture below to pen & ink sketches and paintings. Each effect comes with a few sliders that manipulate settings like Edge intensity, Color Blending or how dark / light the resulting image should be. The results look incredible if you play around with the sliders for a while. The default settings produced for instance a mediocre pencil sketch of a person but after playing around with the settings for a while the result was astonishing. Well I’m laughing at the effects, I suggest you don’t use this for anything professional. (It’s like using clip arts during a huge conference).